I think chicks might dig the Moro. Morovich is sort of a romantic style player, willing to gamble a bit, for exciting chess. Has the tactics chops to often pull it off. Nice looking fellow, to go along with the style. I bet he knows what wine to order at dinner, and can even pick up the check. Damm, I'm interested, and I'm not a chick! Strange, only a man insecure of his own sexuality would need to reply so negatively. "Cute?" as in "awww how sweet?" - then Kosintseva and Kosintseva fits that perfectly lookin at tose photos. So does male popster Justin Beiber and i am straight. Attractive? - Some of those women are but what is attractive to me is not attractive to you or anyone else. The same goes for the male GM's. There are plenty for equal measure for sure. Any unbias non homophobic male can see what is visually attractive about another male without questioning is sexuality. 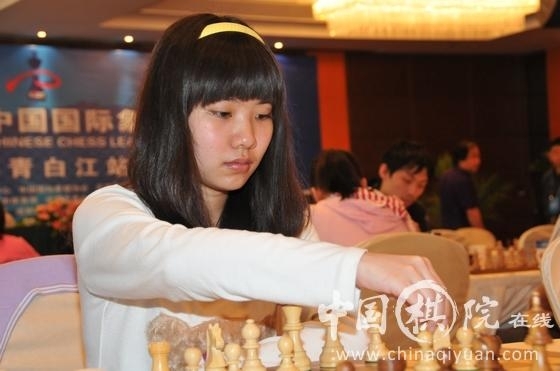 Aug-14-11 Blunderdome: Congrats to Hou Yifan on the win. Aug-14-11 Kanatahodets: Hou is good, but still she needs time to reach Judith`s level. I`m pretty sure she will do it in two-three years. It`s quie a bold statement given that Pogar was in top 10. HeMateMe: I always thought Stefanova was the most "worldly" of these women. She had the rep years ago of being a bit of a carouser, at the clubs and discos real late, wasn't nervous about meeting new guys, or telling them to go away. I would guess she's been around the block and is wiser for her experiences. She looks great with the flowers in her hair. Ladolcevita: Congrats to Yifan on her win too. It's hard to say whether she could achieve what Judit has established before,for that's simply so very remarkable,but nevertheless she's already one of the few strongest female chess players through all the history,and sometimes I believe it depends on a great deal of things to see a further progress such as talent,cirmstances,study,form,chance,etc.,that's- all the same for either gender,for anybody.Maybe some people just have a better sense with chess,and somehow got to be very successful like the world would have them do,but that's still based on their work and devotion. We also know that not every male genius has entered the threshold of top10 or top5.We have once before us a lot of promising male talents who however,as time passes by,turn out to be just mediocre or who just find more interest in other areas as they get to know themselves better growing up. So even if Yifan didnt achieve that great,it wont necessary mean anything like women are incapable of blah blah,or Judit is so exceptional,an outlier that couldnt demonstrate anything about women's capacity. The only fact is that Yifan is just a young chess player of roughly a 2600 rating right now like any other of this rating,and even there is some difference between both genders,they are pursuing the same thing over the board.And some of them might turn 2700 or even 2800, some might not,which perhaps more depends on the individual basis than gender.I think chess is just not that kind of an activity like balance bar(maybe man can do that very well too if there's no danger of sitting astride the bar in training...)or 100-metre race(some women run really fast too) or even in intellectual area,like mathematics or modern physics that would generally be considered as a male domain(still there are many women scientists and mathematicians) ...but the natural difference of gender is even more invisible and less in chess,if not at all,for anyone can play or study the simple regulation of chess and learn to move the pieces over the board in a better fashion,if they please. Aug-15-11 dangerhump: So what's the equivalent to "Chicks love the long ball" in chess? Is it "Chicks love the sac exchange?" HeMateMe: I think the gals here should vote on most buff GM. If some of the guys want to vote, thats fine too. Morozevich is cute so long as he remembers to shave and mind his hair. Aronian has a certain dash to him. And Ivanchuk _used_ to be dark and handsome until age and liquor got to him, but you can say the same about Tal. Cutest male GM? I'll admit to not having spent as much time on this subject, but from the pictures I've seen Morozevich and Grischuk stand out. Physical attractiveness is one of those topics people will never stop talking about. I don't know what makes this completely understandable human reflex objectionable. Aug-16-11 DrMAL: Fabulous tourney for Hou, and a great one for Lahno too. Some others performed well, but not so for Kosteniuk who did not manage a single win, hope she fares better next time. YouRang: I wonder if the statistics confirm the conjecture that there's a negative correlation between motherhood and chess ratings? HeMateMe: Seems to be consistent. Less time for study, less motivation, or perhaps a little bit of both. whiteshark: In the grand design, women were definitely drawn from a different set of blueprints. Aug-17-11 Kaspablanca: In my opinion the prettiest women chess players are Kosteniuk, Pogonina and Lahno. Aug-18-11 Everyone: <I play the Fred> But I'm exactly doing that! Aug-18-11 zluria: Listen, I have this sick hobby of showing my female friends pictures of chessplayers and asking them which they think is the hottest. The hottest top GMs are... (drumroll) Morozevich and Radjabov! Kramnik is considered pretty handsome, too, but Anand, Topalov, Carlsen, Karjakin and Aronian don't usually make the cut for some reason. Aug-18-11 Catholic Bishop: the early 90s Kramnik with the ridiculous fro/comb over combo would probably land on the bottom of any 'hot' list, the early 2000s Kramnik could easily top the very same list.